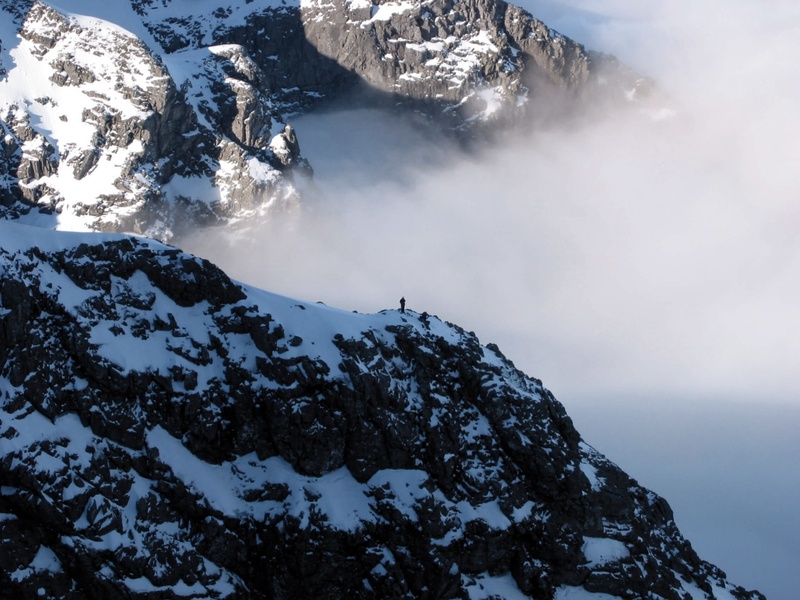 At the start of winter, Tower Ridge can feel quite hard. When the rocks are not fully covered with snow, or worse, when they are covered in verglas, moving up the rocky ridge is slow and laborious. When your rate of progress is slow in the shorter days at the start of the winter, many people finish the climb in the dark - and some spend a cold night out on the ridge! So, wait until the spring when the days are long, the snow cover is brilliant and the rock is starting to become exposed again in all the right places for hand holds. The sun gets high enough in April to give an Alpine experience in Scotland. Tower Ridge is the ultimate super-classic climb that is long, beautiful and has its crux sections right at the top. When the weather is good and you are moving well after a few months of wearing crampons, Tower Ridge is a delight. Standing on the Great Tower in the sunshine, looking forward to Tower Gap with excitement instead of trepidation makes it a much more fun experience! This, the most famous of the great Nevis ridges, is a magnificent expedition. Technically easier than the North East Buttress and Observatory Ridge but it should not be underrated. The main difficulties are concentrated high up, and the whole route is exceptionally long and arduous, fully justifying its grade of IV. The normal winter route avoids the face of the Douglas Boulder by entering the foot of Observatory Gully to the left and then cutting back right to climb the East Gully to Douglas Gap (I). An alternative start is via the Douglas Gap West Gully (I). From the gap an awkward 20m groove/chimney leads to the crest of the ridge, which rises gently and becomes quite narrow. It is possible to reach this section and avoid the moves out of the Douglas Gap by traversing in from higher up Observatory Gully over rocky steps and steep snowfields (II). From the narrow section most teams go out right on a gently rising steep snow ramp until overlooking the west flank above Vanishing Gully. Cut back up left onto the crest and follow it past The Great Chimney on the left to beneath the Little Tower. This usually requires three pitches of climbing, the first over a huge spike with a step right out of a groove above and the second on the left up a groove leading to a huge flat boulder. Above the flat top of the Little Tower an easier section leads to the foot of the Great Tower, an impossibly steep rock step. On the left side of the tower a very exposed and steeply banked snow ledge (The Eastern Traverse) is followed horizontally left, down slightly and round an edge to beneath a huge fallen-block chimney. Pass the block, steep walls and ledges to the top of the Great Tower with some difficulty. Follow the very narrow and exposed crest towards Tower Gap, descending slightly. Climb down into the gap (tricky and loose!) and either ascend the far wall or a slab on the left. The main difficulties are over once Tower Gap has been negotiated. Climb the final section of the ridge to the plateau, moving right beneath a steep wall at the top. Note: it is possible to continue the Eastern Traverse by an exposed delicate step further left from the foot of the chimney. This leads to a very exposed and steeply banked snowfield traversing to Tower Gully and avoids the difficulties higher up. This may be a good ploy for teams who are late and tired and wish to avoid a night out. On reaching Tower Gully it is also possible to descend with care to the hut by a traverse beneath Gardyloo Buttress and on down Observatory Gully. The first ascentionists overcame the Great Tower by taking the cliff on the west side (Western Traverse, 70m IV,4**). For fast parties on top form and blighted by queues on the Eastern Traverse this more difficult way may offer a chance to get in front (or lose your place in the line). Not for the faint-hearted! 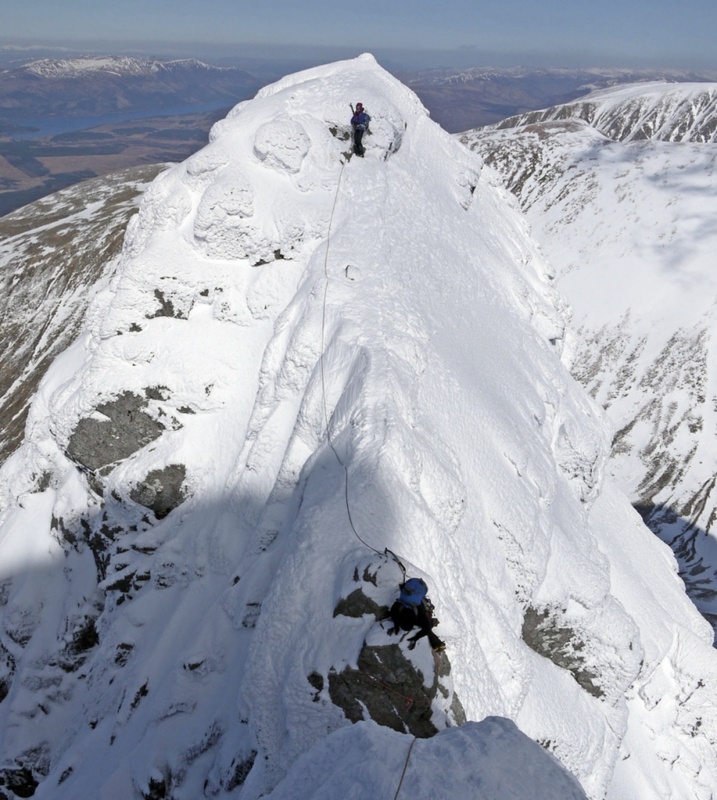 For more guides by Mike on some classic Scottish winter routes, see the following: Point Five Gully, Gemini, Curved Ridge, Number Three Gully Buttress.